According to its application, up to 20,000 are expected to take part. The far-right Freedom party will hold a rally and a march on the occasion of Day of Defender marked in Ukraine on 14 October. Its activists plan to walk from Shevchenko Monument to Mykhaylivska Square in central Kyiv, the public communications department of the Kyiv city administration has told the Ukrainian News agency. According to the party's application, up to 20,000 are expected to join its rally and procession from 3 p.m. to 7 p.m. Kyiv time, to be followed by a concert on Mykhaylivska Square. 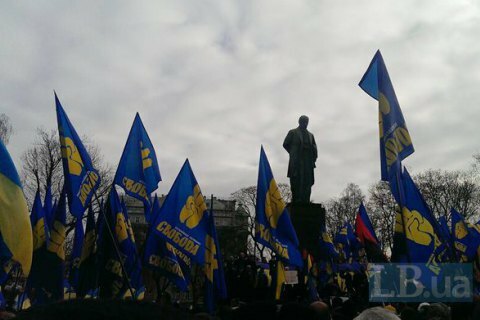 The Society of Assistance to the Armed Forces of Ukraine and Naval Fleet NGO and the Azov Civil Corps also applied for a rally and a procession with up to 5,000 participants in a different part of Kyiv downtown. The Kyiv city administration has received nine applications for rallies on 14 October by 10 October. Ukraine first marked Day of Defender on 14 October, the day Orthodox Christians and Greek Catholics celebrate Protection of Our Most Holy Lady Theotokos and Ever-Virgin Mary, in 2015. Thus it abandoned the Soviet holiday of Day of Fatherland Defender marked on 23 February. 14 October is also celebrated as the day of the establishment of the Ukrainian Insurgent Army (known as UPA in Ukrainian), an armed wing of the Organisation of Ukrainian Nationalists (OUN).